"I know that we think that the founding of America is really it's starting place, but I think it's the end of the Civil War, or more precisely, the issuance of the Emancipation Proclamation on January 1, 1863 that we really, as a people, as a country, began our national life." There is just some aspect of watching a Ken Burns documentary that is like a meditation. There is just this metaphysical place that one ascends while being slowly hypnotized by the trailing camera pans of stills, the reverential navigation and the proper period music. The Civil War is an exemplar of his style and succeeds on so many levels; it is difficult to enumerate them. Easily accessible for those who know little about the war between Americans over a hundred years ago and also immensely enjoyable for those very familiar with the history, this film can change your overall perception of America. The narration is understated but compelling and the readings by a vast array of celebrities achieve a special kind of historical poetry. The interview portions are very well integrated and contain most of the pointed material that brings out the themes of Burns' discoveries about the war. The music is lovely, compelling and contributes mightily to the watchability of the lengthy film by driving the story in subtle ways and capturing a flavor of the times. The content of The Civil War is so vast and detailed that one might wonder how such a film was ever completed. This is an excellent DVD, exemplifying some of the promises of the medium. The long-form nature of The Civil War, at nine hours long, is difficult for television broadcast. One must watch the film over a series of days or weeks with inevitable interruption and distraction. Complex issues and ideas can pass quickly with little time for examination. However, with this DVD, one can proceed at a pace that allows for full appreciation of the nuances and details.Another fascinating aspect of viewing this major documentary on DVD is the cumulative affect of the film as one proceeds through the episodes. Themes and references are reinforced and bring new weight to the "experience" of the war. The first part places the political and social context of the war in its time as well as in relation to our time. The major themes of liberation, militarization and politicization are laid out. There is a certain participation in the "March of Time"-type newsreel that adds to the immediacy of the section. Historian Shelby Foote makes his first appearance (he will become a familiar figure in viewing this documentary) and his commentary follows a thread of analyzing a Southern-oriented viewpoint. Barbara Fields, another historian also makes her first appearance, providing an African-American viewpoint. One of the aspects of this documentary is that it goes beyond listing the battles, the generals and the politicians. The issue of slavery as a monumental contradiction of freedom in America and the double-edged importance that ending slavery assumes in the progress of the war will come as news to many American who know little of the complexities of the conflict beyond Robert E. Lee and Stonewall Jackson. In this first part, we also see many pictures of faces: faces of soldiers and slaves, Union and Confederate, men and women dominate this documentary. It is the gift of Ken Burns in documenting history to personalize these events, to make them apply to real people—people who are as real as the viewers. No one had really fought a war in America for 50 years, aside from the preparatory Mexican war. With typical American ingenuity, a whole new way of fighting a war was to be invented and it involved a shocking bloodiness that is unmatched in history. Between strategies and technology, the destructiveness of modern warfare was born on the green fields and wildernesses of these once united states. Many battles of the Civil War had as many as 30 per cent casualties. As 1862 began, over a million men were massing for—and so many would never return home from—a war they thought would be a very short and quite bloodless affair. America, a land of small farms and small towns, was now affected by far off and exotic locations like Montgomery, Alabama and Manassas, Virginia. This episode also details a nation gearing up for civil war with endless wrangling, politics, opportunism and corruption, all the best and worst of America. The dilatory generalship of George McClellan is a feature and the varied contemporary opinions of Abraham Lincoln are fascinating. The casualties begin to mount as the armies engage in earnest battle and what had seemed to be a lark was now settling in to be the worst event in a young nation's history. This episode explores some of the changes that were beginning to occur in America as a result of the millions enlisting in the armies. Some are actually calling for a negotiated settlement of the war and only the steadfast determination of Lincoln to keep the country united prevents it. Generals Robert E. Lee and Ulysses S. Grant begin to emerge as figures of importance and emancipation begins to assume a larger role in creating a larger reason for what was shaping up to be a filthy and brutal war. Many are surprised by the strength of resistance that the Confederates are able to mount. Their soldiers seem more determined and their generals seem better prepared, and braver. Some of the horrors of war as executed in the strategies of Union generals are examined. The Union defeat at Fredericksburg is a quintessential example of incompetence and bravery as 9,000 died in an ill-conceived assault on a fortified Confederate position. It is here that Robert E. Lee was quoted as saying, "It is well that war is so terrible... we should grow to fond of it." The film walks an even-handed path between the glorification of war that is part of our historical tradition and the terrible reality. One quote from a letter might express in poetic terms the beauty of battle and then another will matter-of-factly describe in excruciating detail the pain of the experience. Elaborate description and analysis of the Battle of Gettysburg is the highlight of this episode. Mixing photographs, maps and shots of the battlefield to demonstrate strategy and events, this is one of the best portrayals of the conflict I have seen. This episode chronicles the grim, inevitable, grinding victory of Grant over Lee, as the Union Army, with its vast resources, chased the rebels through the Virginia countryside. More precursors to the terrifying destructiveness of modern warfare are found in the trench-like engagements and the horrors of new technologies. The battles of The Wilderness and Cold Harbor set new standards for death tolls in battle. This chronicles the cost of the war in troubling detail. Struggles with the emancipation as an aim of the war are examined and Lincoln runs for re-election during a civil war, something that had never before been done. Beginning with a potent quote from Oliver Wendell Holmes, this episode explores in depth the brutal conclusion to this brutal war. The changes in America are enumerated from the direct destruction resulting from the conflict to the social changes of the new country emerging from the conflict. There are moments of overwhelming pathos, particularly in context of having viewed the entire documentary. The scenes of destruction are terrible and the quotes from William Sherman are terrifying in their straightforward explication of brutal intent. In the strategies of Grant and Sherman are found the birth of modern battle strategies, with burn-and-destroy war on civilians and the meat grinder approach to wearing an opponent down and destroying their will to fight. The elegant dance of 19th Century warfare was gone forever. The straightforward nature of this episode makes the facts even more chilling. It is so easy to gloss over the Civil War and forget how terrible it was, even beyond a casualty figure. The aftermath of the war is the focus of this episode, including the defeat of the confederacy and the emergence of a new American nation. As Shelby Foote puts it, before the war it was "the United States are" and after, it was "the United States is." There is a fascinating side note about the millions of photographs of the war that were lost and the glass plates that were sold to gardeners for greenhouses. As in the previous episodes, there are epistolary comments by participants that bring home the personal effects of the conflict. Ultimately, this is not the story of a war but rather a story of a people. Image Transfer Review: In another case of "how could they possibly get it done," the entire film The Civil War has been redone with enhance colors, cleaned up scars and better black levels. It is simply marvelous and is a gorgeous viewing experience. There is magic in the way Burns uses still shots with narration to focus on the words spoken and creates action out of a series of photographs. The crispness, detail and steadiness are a pleasure, which is a necessity in a long-form video. Audio Transfer Review: The Civil War is a lovely example of the transfer of a monaural original to a new digital five-channel soundtrack. The elements of voice, sound effects and music are intelligently and engagingly parse to the various locations in the ambient space. The closed-space feeling of so many documentaries is excellently superceded and the sound design helps to create a larger mental space on which the canvas of the film now appears. Civil War: Reconstruction (8:10) is a short documentary that describes the digitizing of this 12-year-old film and the new sound mix. Colorist John Dowdell quotes Ansel Adams as referring to a picture negative as "the score" and the print as "the performance." Dowdell shows the film reel of The Civil War and says, "Here is the score, and we are going to make a whole new performance of the film." Fascinating details about video transfer are included, such as what a "Henry Artist" is. The decisions on the sound transfer are also interesting. Ken Burns: Making History (7:15) - Another short piece that focuses on the filmmaker and his process of discovery in making his films. A Conversation with Ken Burns (10:24) - This fascinating bit explores some of the philosophical questions that Burns explores in finding the themes of his films and the techniques he uses to bring history to life. 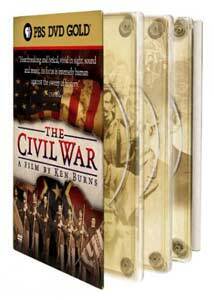 Commentary Tracks - There are selected episodes with commentary material from Ken Burns. His comments are very interesting and add nicely to the episodes. He seems to know that what he has here is pretty good and doesn't waste commentary time in pointing it out to us. Rather, he adds anecdotes, personalization and shading to some of the more interesting aspects of the film. Battlefield Maps - Includes information about the map and links to the portions in the episode to which they apply. Civil War Challenge - Each disc contains a group of five history trivia questions. A relatively innocuous feature that allows one to test one's memory seems better in potential than actualization. Biographies - Includes many thumbnail biographies about figures involved in The Civil War, both large and small. The biographies are divided into North, South and Civilian. Link information to the PBS Online site about The Civil War and general information about PBS DVDs. The Civil War is an awesome achievement of filmmaking and an amazing viewing experience. There is so much to be learned about war in general and about our nation that can be found in the story of this bloody conflict. The beauty of this DVD is that one can watch the episodes more than once and at one's own pace, to fully explore the nuances of the evidence of humanity and inhumanity presented.